Tēnā koe, and welcome to a new regular blog feature. Ngā Taonga holds an enormous amount of audiovisual material and in some cases we don’t have complete knowledge to fully catalogue items. Questions remain: Which beach is shown in this footage? What are these people doing in that recording? Our monthly newsletter features catalogue items that we would love your help with. The collective brainpower and memory of our readers is both huge and helpful – everyone knows and remembers different things. Our March 2019 issue featured this story about an unknown bowling club. We also received information about Syme Hut on Mt Taranaki. Below are updates on these, plus a new clip to mull over. In The Land We Live In, footage jumps around different parts of the country. A section apparently in Wellington shows a bowling and tennis club that Ngā Taonga staff were unable to identify. 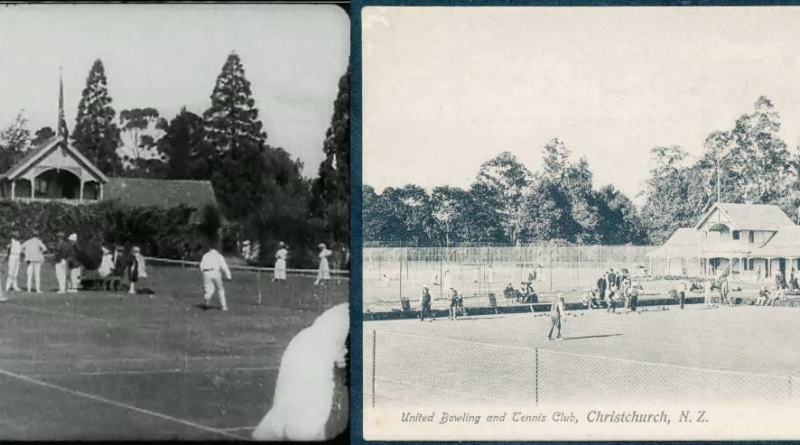 After some sleuthing it was revealed to be the New Zealand United Bowling and Tennis Club in Christchurch, now known as Te Kura Hagley Park Tennis Club. Brucie Raines and John Clark both provided photographs and important pieces of information – thanks so much to both of them. The New Zealand United Bowling and Tennis Club in Hagley Park, Christchurch. Left: frame from The Land We Live In; Right: postcard. For Taranaki Anniversary Day we showed footage in our catalogue of Syme Hut being opened in 1930. Margaret McMahon from the New Zealand Alpine Club got in touch with photographs and more information about the occasion. Margaret also tells us that the Alpine Club deposits their photographs and documents with the Hocken Library Collections – it’s always pleasing to hear when groups support archives in this way! Many thanks to Margaret and the Alpine Club for the information. Syme Hut opening. Left: photograph supplied by NZ Alpine Club; Right: frame from “Mt. Egmont” Opening the new Syme Hut. This month’s film clip to consider – ‘Personal Record. Osler, James Mitchell. [Various scenes: Highland marching band; crowd at the races; surf casting; dying shark; Māori wedding]’. James Osler was an amateur filmmaker who moved from Scotland in 1906. 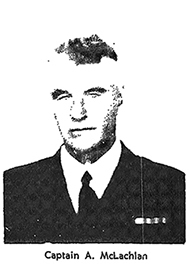 He worked as a baker and opened Osler’s Luncheon Rooms in Wairoa. Some of his community films would be screened above the bakery in a room sometimes known as Osler’s Hall. The footage below is from 1946 and includes a marching parade, a wedding and fishing scenes. We believe the film is from Wairoa or the Hawke’s Bay region but have little other information to work with. We were saddened to learn that our depositor contact for this film, Judy Whyte, has passed away. Osler was also one of the filmmakers featured in Jane Paul’s MA thesis Visual Histories: Amateur Film in New Zealand.